The Rise of Instagram: It's become a big deal! Social media – it is arguably the most significant platform for online marketing and getting your business noticed by a big audience fast. But, gone are the days when social media marketing was just Facebook and Twitter. There’s a new sheriff in town and it’s becoming more powerful by the day! But what is it that has put Instagram alongside the big fish of Twitter and Facebook? How has a simple media sharing app become a necessity in your online marketing strategy? In this article, I’ll show you how and why Instagram is a must for your fitness business. Launched in 2010, Instagram had 1 Million followers in just 8 weeks. They now boast a whopping 700 Million active users! Instagram has launched many people into stardom, including Fitness Models, Michelle Lewin (12m followers) and Jen Selter (11.5m). Facebook purchased Instagram in 2010 for approximately $1 billion. From these stats alone, it’s evident that Instagram is a big player, but I’m still baffled to see businesses not utilising it to it’s maximum potential. Over the last 24 months, the team of Instagram have also made the network much more beneficial for businesses, adding call-to-action buttons, location maps, and much more. So, ultimately the main question is…are you using Instagram to it’s maximum potential? If you can’t instantly say “Yes, 100%” then the answer is no. But don’t fear, it’s not as painstaking as it may sound. The first place to start is obvious – setting up an Instagram account. It’s really simple to do, just download the app and follow their easy instructions. Enter a couple of details (name, email – the usual) and then you’re good to go! Now, I’m sure the majority of you have already reached this step and I don’t want to bore you on the basics – I want to delve a little deeper than that. Having your business on Instagram is good, but being active on Instagram is a totally different matter. When I say active, I mean actually posting content and engaging with comments frequently. According to Instagram’s recent stats, there are approximately 70 million uploads every single day! So uploading once a week simply isn’t going to cut it. As I mentioned earlier, Instagram is now a big fish in the social media pond and shouldn’t be treated any other way. You should be uploading posts to Facebook pretty much every day, and Instagram is exactly same. This is one of the mistakes that causes businesses to flop on Instagram; not showing it the same focus and dedication as Facebook. Yes, Facebook is still top dog…but Instagram is a growing pup! Posting regularly (hopefully daily) is a must on Instagram, but your content needs to be attention-grabbing and valuable. I say attention-grabbing first because Instagram is primarily a visual platform and users typically scroll through their feed effortlessly, like a robot, until something grips them. Your posts should be visually appealing and of high class…blurred images are a big no! In fact, blurred poor images are a big no-no in all of your digital marketing – it’s 2017 after all! Gaining followers is one of the most common frustrations for Instagram users, both business and personal. It’s become somewhat of a craze to get more and more followers – the more the better. I understand the thought behind it, I mean, a business with 1 million followers can seem more appealing than one with 200 followers, but you don’t want to fall into this trap – it can be deadly. It’s much more beneficial for your business to have 100 quality followers, who are either previous customers or potential customers, rather than having 1,000 followers who are on the other side of the world and never engage in any of your posts. Remember, you’re ultimately using Instagram like all other social networks – to generate new leads. It’s not a popularity contents, so try not to get too stressed about your following, as the quality of your content may end up suffering. There are a number of ways to build your following with high quality users. Maybe run a competition giving away a number of free sessions to a lucky new follower. Ask people to tag a friend and then follow you to be entered in the draw. Send out an email blast, too, letting all of your subscribers know that you’re on Instagram and add a link for them to follow you. Add your Instagram link wherever you can – from your email signature to your printed T-shirts. There are many ways you can build a following of high quality users. It doesn’t happen overnight but it will be worth it in the end. Instagram is going to keep growing! In my professional opinion, Instagram won’t stop growing any time soon. Right now, it’s in trend. From the youngsters who double-tap every Kardashian post, to the #FitFam followers who use it for inspiration. It doesn’t seem to be dying down anytime soon. 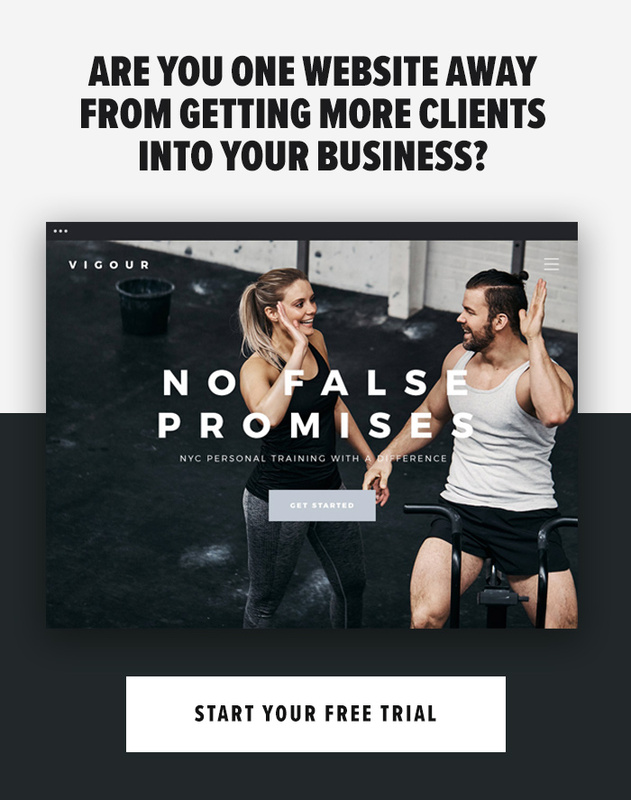 Furthermore, Instagram’s recent addition of a business profile and call-to-action buttons, shows just how seriously they’re taking the app for online marketing, too. I can almost guarantee your competition are utilising Instagram for their business, which is why you should be, too. So what are you waiting for? Let’s start taking Instagram seriously and making it a huge part of our online marketing strategy – you will thank me in the long run!